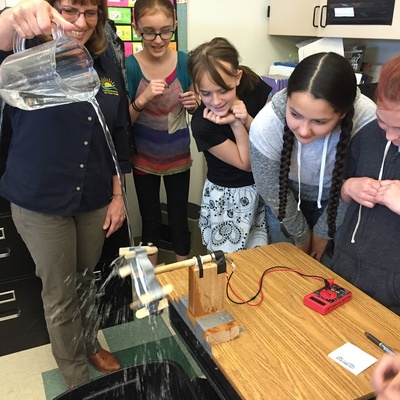 Renewable Hydropower – During this presentation, students will learn about atoms and how they relate to electricity. They’ll be given an easy-to-understand explanation of how hydropower is produced at dams and why it is a valuable renewable energy resource. Students will be put into 5 teams to build small turbines using various materials. They will then test the turbines by pouring water over them to see which is most effective in producing electricity. Electricity Science and Safety – In the first half of this presentation, students will learn what electricity is, where it comes from and how it travels to us. They will be put into 8 teams to construct simple circuits using batteries and light bulbs. They will gain an understanding of closed and open circuits, and insulators and conductors. The second half will focus on how to stay safe around electricity both in and outdoors. Our electrical safety display will be used to educate students on hazardous electrical situations outside and how to prevent them. The crackle of high voltage electrical arcs will reinforce the safety messages we want them to learn and share with their families.